Whether it’s just one or several, losing natural teeth can have significant consequences for your oral health, your smile’s ability to function, and your overall quality of life. 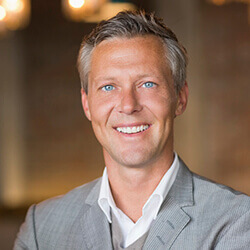 Thankfully, Dr. Scott Parker offers multiple reconstructive solutions for the benefit of his patients, including state-of-the-art dental implant restorations. 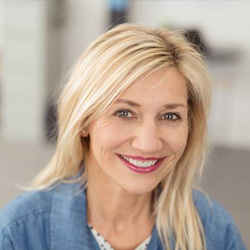 Unlike more traditional alternatives, dental implants replicate the entire shape of your original tooth, restoring both health and aesthetic appearance in a way that’s sure to exceed expectations. Contact our Calimesa, CA practice today if you’re ready to regain the complete, strong smile you deserve! 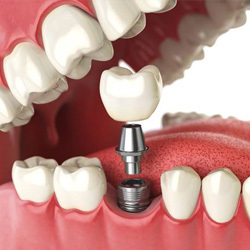 A dental implant is actually a very small titanium post that is placed directly into the jawbone to mimic the root structure of a natural tooth. There, it can be used to support a number of restorations to replace any number of missing teeth. This prosthetic root not only gives new teeth an extremely firm foundation, but it also helps prevent the bone loss that is common after tooth loss. So, in addition to restoring a patient’s smile, implants also help them maintain the overall shape of their face. Lifelike Appearance: Because dental implants are built just like natural teeth, they look just like natural teeth as well! They are usually topped with 100% porcelain restorations, helping them completely blend into the smile. 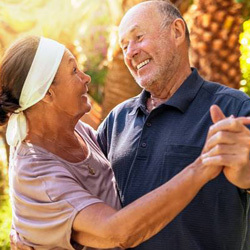 Longevity: Traditional dentures and bridges typically need to be replaced every 7-10 years, making them quite costly over the course of a patient’s life. Dental implants, however, can easily last for more than 30 years with just regular brushing, flossing, and dental checkups. Strength: Dental implants have a hold and security typical prosthetics simply can’t match. They are anchored into thick jawbone, so you’ll be able to trust your implant to stay in place whether you’re speaking or eating your favorite food. After we’ve determined that dental implants are a good choice for your current level of oral health and personal goals, Dr. Parker will personally recommend a trusted specialist in the area to handle their surgical placement. Implants need to be inserted into the jawbone so that they can begin to form a strong bond with the natural tissue, setting the stage for replacement teeth to be attached on top. Once a patient has recovered from this procedure, they’ll return to our office so that we can design and place the ideal restoration. There are multiple restorations options available to patients, and our team will be sure to recommend the one that works best with your unique situation. Individual implants are restored with all-ceramic dental crowns, which fit into place without requiring any significant alteration of nearby healthy teeth. When covering multiple implants, an implant-retained bridge or denture is an excellent choice because of there more comprehensive and cost-effective nature (compared to restoring each implant individually). These prosthetics can be designed as fixed (permanent) or removable, depending on your preference. As with any dental procedure, cost is always a big factor on people’s minds. When it comes to dental implants, it’s important for people to understand that there is actually no set price for this treatment. Factors such as how many teeth a patient wants to be replaced, their dental health, and their insurance coverage can make the final cost vary quite a bit. While implants do tend to be more expensive upfront compared to other replacements, they are actually the most-cost effective restoration over time. As we touched on above, implants can easily last for 30 years or more with just routine oral hygiene. Over that course of time, the price of a single implant is only about 30-40 cents per day. On the other hand, if a bridge or denture lasts for the expected 10 years, it will cost about 80 cents to a dollar a day. Overall, less than 50 cents a day is a small price to pay for a restoration that is the next best thing to a natural tooth! If you’re ready to stop worrying about your missing teeth whenever you meet up with friends or sit down to eat, all you need to do is call your dentist in Calimesa to schedule an implant consultation. In just a matter of months, Dr. Scott Parker can help you reclaim your complete smile for a lifetime to come. To schedule an appointment, contact us today.